Narayan, H., Alemu, H. (2017). A Comparison of Photocatalytic Activity of ‎TiO2 Nanocomposites Doped with Zn2+/Fe3+ ‎and Y3+ Ions. 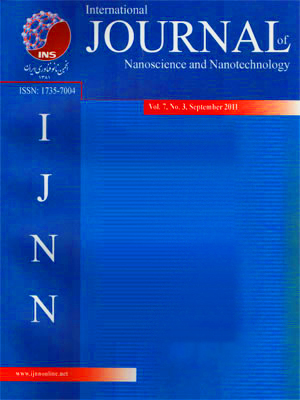 International Journal of Nanoscience and Nanotechnology, 13(4), 315-325. H. Narayan; H. Alemu. "A Comparison of Photocatalytic Activity of ‎TiO2 Nanocomposites Doped with Zn2+/Fe3+ ‎and Y3+ Ions". International Journal of Nanoscience and Nanotechnology, 13, 4, 2017, 315-325. Narayan, H., Alemu, H. (2017). 'A Comparison of Photocatalytic Activity of ‎TiO2 Nanocomposites Doped with Zn2+/Fe3+ ‎and Y3+ Ions', International Journal of Nanoscience and Nanotechnology, 13(4), pp. 315-325. Narayan, H., Alemu, H. A Comparison of Photocatalytic Activity of ‎TiO2 Nanocomposites Doped with Zn2+/Fe3+ ‎and Y3+ Ions. International Journal of Nanoscience and Nanotechnology, 2017; 13(4): 315-325. TiO2 based nanocomposites (NCs) were synthesized using the co-precipitation/hydrolysis (CPH) method. The composition of the first set (TZF) and the second set (TY) of NCs were: TiO2. [ZnFe2O4]x (with x = 0.1 to 0.5), and TiO2. [Y2O3]x (with x = 0.1 to 0.5), respectively. NCs with average crystallite size of 29 nm were produced whit co-doped Zn2+/Fe3+ ions into TiO2. This size was 17 nm when Y3+ ions were doped. Characterization of all samples were done by scanning electron microscopy (SEM), transmission electron microscopy (TEM), x-ray diffraction (XRD) and particle size analyzer. Visible light photocatalytic degradation of the dye Congo red (CR) was investigated in the presence of each of the samples. In comparison with pure TiO2, enhanced photocatalytic activity was recorded with NCs. The NCs with x = 0.2 and x = 0.1 of TY and TZF sets, respectively, showed maximum photocatalysis both in terms of the apparent rate constant, as well as the percent degradation observed after 180 minutes. It was noted that enhanced photodegradation is directly related to the reduced particle size of the composites which implies that, photosensitization is the dominant process. The better photocatalytic activity observed with TY in comparison to with TZF NCs was attributed to the effective suppression of the e–/h+ recombination because of the trapping of photo-generated electron by the Y3+ ions.